I realise some will concentrate on the time taken since these models were first announced some time ago by the Kernow Model Rail Centre, it has been well documented that the necessary research for the production of the CADS for these diesels with their complex multiple curved exterior shape has taken much longer than planned. When last year additional information came to light the development process moved on at a fast pace and now production of the first versions has now been completed. 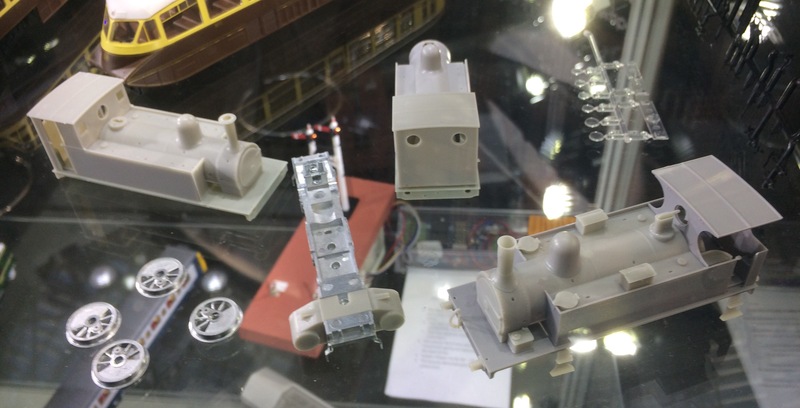 These are the first models that Kernow Model Rail Centre have worked directly with the factory on China on all aspects of the design, tooling and manufacture. Has the time taken been worth it… you bet it has! No 10201 as built. Official BR publicity photograph from my collection. In 1949 the frames for No. 10201, a 1Co Co1 loco, were laid at Ashford Works under the supervision of Bulleid. Before the first loco was completed the frames for 10202 were assembled. The last of the trio, No. 10203, was constructed in 1953-4 at Brighton Works. No 10202, Official BR publicity photograph from my collection. The bolsterless bogie design was similar to that used on the Bulleid/Raworth electric locomotives, CC1 and 2, introduced in 1941, with similar bearing pads, wheels and the mounting of the bogies and brakes. To carry the additional weight an articulated pony truck was included, ingeniously guided by links fitted to the bogie front plate which also carried the buffers. The profile of the body sides was curved to match the profile of the Bulleid coaches of the time. The first production versions of 10101 and 10202 have arrived. In February 1953 Brighton Works commenced assembly of the third member of the fleet, No. 10203, which was completed in March 1954. A number of technical differences were incorporated in this loco, the most significant being the installation of a higher powered engine developing some 2,000hp, rather than the 1,750hp of N0. 10201/2. After its commissioning trials, No. 10203 based at Nine Elms joined 10201/2 on the Waterloo-Exeter line where it demonstrated its superior output. Initial trials of 10201 also took place on the London Midland Region, where all three would return in 1955, whilst on the LMR the chime whistle was also replaced by twin air horns. Whilst on both the Southern Region and the London Midland Region they worked alongside their slightly less power cousins the LMS Twins 10000 and 10001. When built all three were painted in black livery with silver lining, including silver frames, whilst the centre of the roof section was matt black. After the locos were allocated to the LMR, Derby Works outshopped all three in BR standard locomotive green and replaced the waist height silver band with orange and black lining. The roof however was painted a really practical primrose yellow! This of course soon ended up a dirty black colour. A higher view of the pair 10201 and 10202. Near the end of their working lives they sported small yellow warning panels at each end.In November 1962 No. 10201/3 were taken out of service and stored at Derby, being joined by No. 10202 in early 1963. At the end of 1963 all three were withdrawn and unfortunately sent for scrap. This prototype information is an extract of my more detailed article on the SEmG group website here. The first two models, No. 10201 and No. 10202 have now arrived in the UK and are starting to be sent out to those whom pre-ordered. An option for DCC Sound fitted K2701DS and K2702DS is also available, with sound by Legomanbiffo. The models of No. 10203 require slightly different tooling for both the sides and roof which is being worked on at the moment and will therefore at a later date. I will on the whole let the pictures accompanying this post do the talking but read on for additional information. The models arrive in a very sturdy foam lined box in the Kernow Model Rail Centre house style with the locomotive held in the now usual plastic insert and sleeve. Overall the model has a good weight and matches the solid look of the prototype. Showing the engine head signal discs in both open and closed positions. The model accurately follows the complex curves and tumbleholm of the prototype and has a wealth of rivet detail. Above each cab is the whistle (this will be replaced by air horns on the green version of 10203. Also included with the model is a complete set of closed half head signal (route discs) to allow any combination of open / closed discs and head signal codes to be achieved. Buffer beam hooks with and without dummy three link couplings are also included. Tension lock couplings are provided fitted into NEM pockets. The vacuum and steam heating pipes are factory fitted and do not interfere with the couplings. A view of the underside of 10201 showing the internal bearing bogies and the pony truck of the 1Co -Co1 bolsterless design. All six main axles are powered. The models feature a large centrally mounted five pole motor with twin fly wheels, mounted on a die cast chassis block. Drive to each of the 3 main geared axles on both bogies is via articulated shafts. The bogies comprise of internal axle bearings and have both horizontal and vertical play to allow for a variety of track conditions. Electrical pick up is off all main driving axles. I have found them to run extremely smoothly on at least three different layouts and test tracks complete with undulations and they haulage capability is exceptional and they have handled over twenty Hornby Pullman coaches with ease. For those using DCC a 21 pin socket is provided and every model, even the non DCC fitted versions, include a 28mm 8 ohm, 4 Watt speaker! A close up of the roof showing the fine fan grill with fan beneath and also the whistle. Externally the finish is extremely good, an excellent satin black finish and crisp boundaries between the black and the aluminium silver lining and the aluminium silver roof. The fan grill on the roof is a very fine etching with a representation of the fan itself moulded below. The flush glazing is very fine without any noticeable prismatic effect at the edges. Behind the body side windows is a representation of the engine block which if anything is slightly too close to the window but that is due to the fact that it is hiding the motor. Often when running in practice these side windows were in the down open position, I assume to give additional cooling, but this is not possible with the model. Windscreen wipers, lamp irons and handrails are separately applied and the latter also are where applicable the correct flat profile. The bogies themselves are a work of art, heightened by being painted as per the prototype in silver, including many separately applied details such as steps, covers, sandboxes, pipes and speedometer drive. Full details on the variants available can be found on the Kernow Model Rail Centre dedicated webpage here. As I said in the introduction paragraph I certainly feel the wait has been worthwhile and is sure to be a winner with Southern Region and London Midland Region modellers alike. It has been a pleasure to assist the Kernow Model Rail Centre with this project from the outset. The Kernow Model Centre have today made the following announcement about their exclusive models and commissions and I post it below in full. In our determination to provide high-quality detailed models we are constantly reviewing progress of our projects. Sometimes this can reveal that changes need to be made, most of which are invisible to our customers. After careful consideration we have decided to manage the production of our Adams O2 and LSWR Gate Stock OO Gauge models directly with the factory in China, this being the same factory that built our award-winning OO Gauge Beattie Well Tank. We have asked Dave Jones of DJModels to oversee these projects which will continue the close working relationship we have had since we started commissioning exclusive models. Work on the OO Gauge Tiger Clay Wagons, Bulleid Diesel locos and D6xx Warships also continues as well as other yet-to-be announced projects, all of which will be produced under a new commercial agreement of which details will be given in due course. All existing orders for these products will be held and there is no need for customers to contact us about this change unless they have changed their phone number, email address or house address and not previously advised us. A consequence of this decision is that Dapol no longer feel able to progress the O Gauge Beattie Well Tank project and associated clay wagons. We had been working with Dapol to find alternative ways of producing this model, but the pre-orders have been disappointingly low with fewer than 200 orders placed. This is despite a huge discount being offered to encourage and reward customers who placed a pre-order and it being made clear that the pre-order could be cancelled at any time. While we may look at this again in the future for the time being we are going to concentrate on our core OO gauge market. We have already emailed and written to all customers who still held a pre-order for the O Gauge models with details of a special offer to reward their loyalty and patience. Even after the above changes we had around £275k of special projects remaining with Dapol and it was our intention to continue with these, but Dapol have cancelled all of these with the exception of the OO Gauge models of D1003V Western Ruler and B850ZA and B850ZB Weathered Silver Bullets which are already in production. Our exclusive Class 73s, Bubble Cars, Turbots and Class 22s have all been cancelled and we are obviously very sorry and disappointed that Dapol have chosen to do this. This unexpected act means that we have had to remove these models from our website and have not yet had chance to contact everybody who placed pre-orders but will do so as soon as possible. We thank all our customers for their patience and understanding for bearing with us and with our new agreement in place we expect rapid progress to be made on the Gate Stock and O2 models and look forward to sharing positive news about these very soon. I will not make any personal comment on the above other to state that I continue to assist Chris Terise at the Kernow Model Centre with respect to their Southern related models.